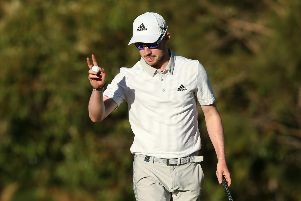 Rookie professional Robert MacIntyre maintained his promising start as Ross Kellett and Scott Henry both produced big improvements in the second round of the European Tour Qualifying School in Spain. In his first taste of the card battle, 21-year-old left-hander MacIntyre has handled the pressure-packed test brilliantly so far at Lumine Golf Club in Tarragona, where the 156-strong field contains a whole host of European Tour winners. Having come home in 31 in his opening 67 on the Lakes Course on Saturday, the Oban man was two-over at the turn on his second circuit on the Hills Course before transforming his day with an eagle-3 at the 11th and then adding a birdie two holes later en route to a 71. On five-under, he’s sitting joint ninth in the six-round marathon, which will see the top 25 and ties on Thursday night secure playing rights on next season’s European Tour. Leading the way after 36 holes are Italian Andrea Pavan (65-68) and Englishman Tom Murray, who leapt more than 30 spots on the back of a nine-under-par 63 on the Hills Course in his second round. Murray, whose dad Andrew is a former European Open winner, carded seven birdies as he came home in 29. David Law is next best among the nine Scottish hopefuls, sitting just outside the top 30 on two-under after rounds of 68 and 73, while Chris Doak, Ewen Ferguson and Kellett, who trimmed ten shots off his opening effort with a 67 on the Lakes Course, are both on one-over. After dropping three shots in his last six holes on the same layout, Connor Syme is alongside Grant Forrest on two-over, followed by Henry and Duncan Stewart on four-over and seven-over respectively. Henry, who tied for second 12 months ago at PGA Catalunya near Girona, left himself with a mountain to climb after an opening 78 this time around but will have been boosted by a second-round 69.